Everybody knows that stress can contribute to hair loss, but what about long term depression? How can you protect your hair in this situation and avoid having yet another problem to worry about? Can Medication For Depression affect your hair, and how can you make sure you're getting the right support? Depression is a condition that can sneak up on people, with its symptoms of tiredness and confusion making it hard to realise that something is wrong. Often people feel the first painful stabs of anxiety when they realise their hair is thinning. This can make it hard to tell whether hair loss is a symptom of depression or the cause. The best thing to do is talk to your doctor and look back at other symptoms you may have experienced in recent weeks. To complicate things further, hair loss and depression can sometimes share another underlying cause. Probably most common among these is an Underactive Thyroid Gland, but other problems can include Diabetes and chronic fatigue syndrome. A Well Man or Well Woman clinic is often the best port of call, as staff there can take the time to work out what tests you may need. It's important to realise that if your depression is triggered by your hair loss that doesn't make it trivial, and it doesn't mean you have less right to support than other people. Losing control over your own body is always difficult to cope with, as are changes in your appearance and thus in the ways other people react to you. Give yourself space to deal with your loss and don't feel bad about feeling bad. All other issues aside, one of the biggest problems depressed people face when it comes to protecting their hair is simply finding the energy. If it's hard to get out of bed in the morning, it's doubly difficult to keep up routines of washing, combing and styling. Often hair ends up getting damaged as a result and in the worst case scenario scalp damage can occur, causing lasting problems. If you are diagnosed with serious depression, it can be a good idea to get your hair restyled in a way that will make it simple and easy to maintain. A shorter cut is usually best, but try to find one that won't need to be trimmed too often. If you like to keep your hair dyed, ask your stylist about long lasting colouring techniques that will keep looking good even if you don't feel up to regular dye jobs. The main cause of damage to poorly maintained hair is tangling. Choosing a special anti-tangle shampoo means your hair is more likely to remain healthy if you can't comb it every day. This will also mean you can get away with less frequent washing. Try to wash your hair whenever you have a good day, so that long periods of bad days present less of a problem. Stress (which is just part of the condition of being depressed) can cause hormonal changes that trigger a variety of types of hair loss. The good news is that almost all of these conditions are Temporary, and your hair can recover when you are better. Unfortunately, hair loss related to depression isn't always immediate. Changes in your hormone levels can stop new hair growing but it's not until older hair falls out (in the natural shedding cycle, which takes about three months) that the loss becomes apparent. This can plunge people back into depression just when they've started to feel better. It's important to realise that your hair may already have started growing normally again, it just needs some time to recover. There is growing evidence that some popular anti-depressants can cause hair loss. This is because they work by altering your hormonal cycle, and any drastic changes of this sort can temporarily halt the growth of new hair. Many individuals are resistant to this, so it's hard for a doctor to know exactly how your medicine will affect you. If you're worried that you may be losing your hair, it's important not to stop taking your medication, even if you feel much better, as this could cause far worse depression than you experienced before. Instead, talk to your doctor. You may be able to find a more suitable alternative treatment. Don't use anti-hair loss medication at the same time as anti-depressants as this could potentially cause serious health problems. When you're depressed, losing your hair is the last thing you need. Fortunately, the right care means that you will probably get to enjoy beautiful hair again when you recover. 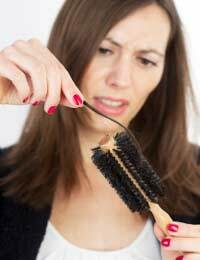 Find out how stress can cause hair loss by reading our feature Stress And Hair Loss on this site.